Not to be confused with Croix-de-Feu or cross and flame. For the practice in Europe, see fiery cross. In Scotland, the fiery cross, known as the Crann Tara, was used as a declaration of war. The sight of it commanded all clan members to rally to the defence of the area. On other occasions, a small burning cross would be carried from town to town. It was used in the War of 1812 between Britain and the USA as a means of mobilising the Scottish Fencibles and militia settled in Glengarry County, Ontario against the invaders, In 1820 over 800 fighting men of Clan Grant were gathered, by the passing of the Fiery Cross, to come to the aid of their Clan Chieftain and his sister in the village of Elgin, Scotland. The last other significant use in Scotland itself was in 1745, during the Jacobite rising, and it was subsequently described in the novels and poetry of Sir Walter Scott. This scene is accompanied by an unnumbered plate illustration by Arthur I. Keller, captioned "'The fiery cross of old Scotland's hills'", showing two robed, unmasked Klansmen over a bound, blindfolded and gagged African-American, one of whom is holding a lighted cross, while robed and hooded klansmen look on. The novel ends with a klansmen waiting for election results stating "Look at our lights on the mountains! They are ablaze - range on range our signals gleam until the Fiery Cross is lost among the stars" meaning that he had won and civilization had been saved in the South. The fiery cross is mentioned once again in the final novel of Dixon's Klan trilogy, The Traitor: A Story of the Fall of the Invisible Empire, when a Grand Dragon tosses a burning cross on a heap of discarded Klan robes and regalia in obedience to the order of the Grand Dragon to dissolve the order. This scene is accompanied by an illustration captioned "Some of the men were sobbing" by Charles David Williams featuring a gathering of Klansmen over a burning pile of robes, carrying three burning crosses. In D.W. Griffith's film The Birth of a Nation (1915), an adaptation of Thomas Dixon's novel, The Clansman, two sequences depict cross-burning. The first sequence depicts a Confederate colonel's little sister, who rejects a marriage proposal from a black captain (of the occupying Union force) and then must flee when he chases her (for background, the Piedmont, South Carolina legislature had legalized interracial marriages, and the story imagines the social chaos that whites feared would develop). She is cornered at the edge of a cliff and threatens to jump off the cliff unless he stops. He continues his pursuit, and she jumps. Her brother finds her dying at the bottom of the cliff and holds her in his arms; she identifies her attacker before passing away. The few members of the local clan burn a small (around 8 inches [20 cm]) cross, drenched in the young girl's blood. A kangaroo court is convened, hears the colonel's testimony of the girl's dying words, finds the captain guilty of murder, and executes him. The clan members place his body on the front porch of the South Carolina governor's mansion with a square piece of white sheeting with the initials KKK. The second sequence depicts the aftermath of two home invasions. The first occurs at the governor's mansion. A black member of the South Carolina legislature proposes to the governor's daughter and, when she refuses, threatens her with weapons. The governor attempts to intervene and is taken captive. The second home invasion occurs at the house of the Confederate colonel; his mother had been found to be in sympathy of the clan by making clan uniforms. The clan wishes to intervene in these hostage situations but is prevented from doing so by the occupying Union troops. The colonel requests help by burning a cross in daytime; the black smoke produced calls clans from neighboring counties to come to their aid and contest the Union military control of the town. Each clan wears distinct head-dresses and robes. They greet each other with their faces uncovered although they ride into town with sheeting over their faces. The colonel's uniform has two adjacent square crosses on his robe, presumably from the original clan in Scotland. 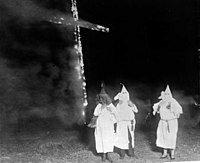 The first instance of a cross being burned in the United States was on November 25, 1915, ten months after the debut of The Birth of a Nation, when a group led by William J. Simmons burned a cross on top of Stone Mountain, Georgia, inaugurating a revival of the Ku Klux Klan. The event was attended by 15 charter members and a few aging survivors of the original Klan. Crosses were burned during the Tallahassee bus boycott of 1956. According to journalist and civil rights advocate Carey McWilliams, several crosses were burned during the 30s in California as part of the intimidation practices of the vigilante groups organized by the Associated Farmers to break off pickers' strikes. In 2003 the Supreme Court of the United States invoked a stage adaptation of Sir Walter Scott's The Lady of the Lake in their Virginia v. Black decision as an example of a display of cross burning that was not intended "to intimidate a person or group of persons" when they struck down as unconstitutional a Virginia statute that included the language "Any such burning of a cross shall be prima facie evidence of an intent to intimidate a person or group of persons" because it presumes the "intent [is] to intimidate.". Wikimedia Commons has media related to Burning crosses. ^ Sketches Illustrating the Early Settlement and History of Glengarry in Canada. ^ "Archived copy". Archived from the original on 2008-01-13. Retrieved 2008-02-27. CS1 maint: Archived copy as title (link). ^ "Tallahassee Bus Boycott Timeline", Tallahassee Democrat, May 21, 2006, "Archived copy". Archived from the original on 2015-01-28. Retrieved 2015-06-05. CS1 maint: Archived copy as title (link), retrieved 6/4/2025. ^ Erwin Chemerinsky. The First Amendment, Wolters Kluwer.